Astronomers Discover First Known "Free-Floating Planet"
Astronomers have made the first-ever discovery of a planet that wanders among the stars but calls none of them home. A team of researchers at UniversitÃ© de MontrÃ©al have discovered a "free-floating planet," which may not sound like much of a big deal to those of you who, like me, learned everything you know about astronomy from Star Trek. But a big deal it is, as this is in fact the first such planet to be discovered. 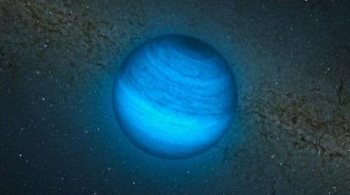 "Although theorists had established the existence of this type of very cold and young planet, one had never been observed until today," explained UdeM astrophysicist Ã‰tienne Artigau. "The absence of a shining star in the vicinity of this planet enabled the team to study its atmosphere in great detail. This information will in turn enable astronomers to better understand exoplanets that do orbit stars." The discovery process has been complicated by the fact that astronomers were previously unable to define whether past candidates were large planets or brown dwarf stars. Doctoral student Jonathan GagnÃ© said that several such objects have been identified over the past few years "but their existence could not be established without scientific confirmation of their age." "Astronomers weren't sure whether to categorize them as planets or as brown dwarfs," GagnÃ© said. "Brown dwarfs are what we could call failed stars, as they never manage to initiate nuclear reactions in their centers." But the Montreal team, in conjunction with the Laboratoire d'Astrophysique de l'Observatoire de Grenoble in France and using data taken from the Canada-France-Hawaii Telescope and the European Southern Observatory's Very Large Telescope, determined that this body, named CFBDSIR2149, is a relatively young 50 to 120 million years old, with a mass of four to seven times that of Jupiter. That's pretty damn huge but still well below the minimum for classification as a brown dwarf, which requires a mass in excess of 13 times that of Jupiter. The discovery supports theories about the formation of stars and planets, and it also suggests that these wandering bodies may be more common than anyone expected. It may throw a bit of a monkeywrench into the linguistics of astronomy, too: The word "planet" comes from the ancient Greek "astēr planētēs," which translates into "wandering star."